Determination of 241Am in urine , Finland. Urine samples are first acidified and co-precipitated with Ca, heated and precipitate allowed to settle and centrifuged. The sample is washed with acid, evaporated; further washings allow a white precipitate to form. Americium is separated with TRU resin and prepared for electrodeposition and samples are counted using alpha spectroscopy. Determination of carbon-14 analysis from STUK, Finland. 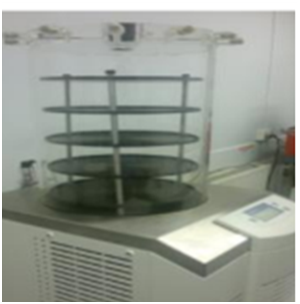 The sample preparation for the liquid scintillation counting was done with 307 Sample Oxidizer by PerkinElmer. Dried environmental samples were combusted completely in the oxygen atmosphere to carbon dioxide and water. 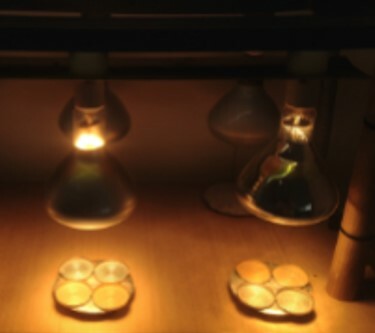 The 14CO2 was absorbed by special reagent CarboSorb E and mixed with liquid scintillation cocktail Permafluor E+. The apparatus is almost fully automatic and the combustion of one sample takes time for only few minutes. 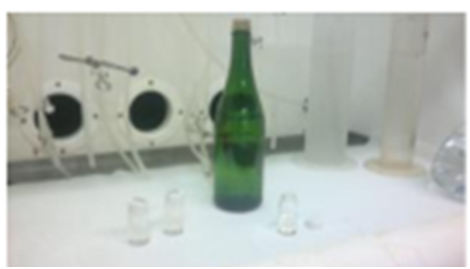 Samples were counted with low level liquid scintillation counter 1220 Quantulus. Determination of gamma spectroscopy from STUK, Finland. 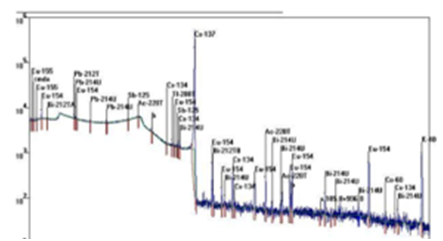 Activity concentrations of gamma-emitting nuclides are measured with a low-background high-resolution HPGe spectrometer. The measured energy range is 30 - 2700 keV. The relative efficiency of the detectors range from 35 - 90%. The samples are meaured in sample cylindrical beakers or 0.5L Marinelli beaker on top of the detector end cap. The efficiency calibrations of the detectors have been obtained with both seperate single line nuclides in water solutions and multi-nuclides standard sources. The following nuclides have been used: 40K, 51Cr, 57Co, 60Co, 65Zn, 88Y, 109Cd, 113Sn, 137Cs, 203Hg, 210Pb, 241Am. The specta are analysed using either UniSampo/Shaman software package or STUK developed GAMMA-99 computer code. The correction for sample height and density, as well as the effect of true coincidence summing, are taken into account in calculation of the results. The uncertainties include both statistical uncertainty and uncertainty due to the efficiency calibration. Determination of tritium analysis H-3 from STUK, Finland. Water samples are distilled twice and following this samples are transferred to 250 ml plastic bottles to wait for measurement. 8 ml of distilled water is added to the sample, and 12 ml of UltimaGold uLLT scintillation cocktail is added to scintillation vials, the sample is shaken thoroughly. Vials are then cool dried for two days using the Quantulus or in the refrigerator. Measurement time for samples is 300 minutes, for background 1000 minutes. Instructions for freeze dryer from STUK, Finland. Fresh samples are put in the shelves of the freeze dryer, the freeze dryer switched on and the the samples are allowed to freeze dry under vacuum for 2 days. At the end of the process the freeze dryer is switched off and the samples removed. Samples can now be used in further analysis. Determination of gross alpha analysis from swipe samples from STUK, Finland. Surface contamination can be measured indirect analysing activity of swipe samples. Indirect methods can be used only for break-away contamination. Swipe can be dry or moisten. In the results calculations, ratio of break-away contamination need to be taken into account. Determination of the alpha activity of the swipe is made using liquid scintillation spectrometers. Determination of gross beta and residual beta analysis; gross beta in water from CIEMAT, Spain. Water sample are heated to near dryness and residue evaporated onto stainless steel planchette until complete dryness.Potassium is determined by atomic emission spectrometry. Samples are counted for beta by proportional counting. Determination of gross alpha analysis from water samples from STUK, Finland. Water samples are measured out into scintillation vials before being dried (by freeze drying or under I.R. lamp. The sample residue is dissolved in of HCl acid, the sample is then shaken for 1hr to aid sample dissolving . Liquid scintillation cocktail (Ultimate Gold AB) is added and the vial closed tightly. With each batch, a background sample is prepared using HCl and Liquid scintillation cocktail. Samples are stored for 30 days in a dark room to attain radioactive equilibrium between 226Ra/222Rn. Samples are then counted using liquid scintillation spectrometers. 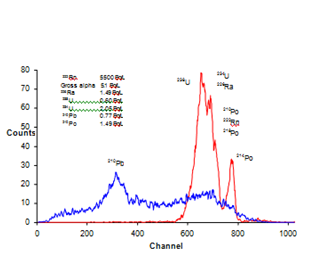 The atomic absorption spectrometry (AAS) is a selective analytical method based on the absorption of radiation by free atoms in the ground state. A given wavelength of an element corresponds to an optical transition between atoms in the ground state and exited level. The absorption is related to the concentration of the atoms and thus to the concentration of the element. By measuring the intensity of the absorbed radiation the amount of an element in the sample may be determined. Neutron activation analysis instructions from NMBU, Norway. Neutron activation analysis (NAA) is a nuclear process used for determining the concentrations of elements in materials, applications research fields ranging from chemistry to archaeology. NAA is based upon neuron activation, where the sample is bombarded with neutrons, forming a radioactive isotope, studying the spectra emissions of the material, can determine the activity concentration of the elements contained. NAA is very sensitive and is therefore used to analyse for minor elements, which are present in very low concentrations. 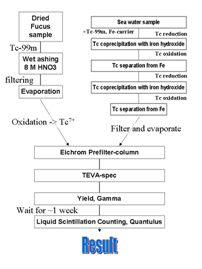 The method is especially useful for trace element analysis. NAA can detect up to 74 elements depending on the experimental procedure, with minimum detection limits ranging from 10-7 to 10-15 g/g, depending on the elements and matrix materials. 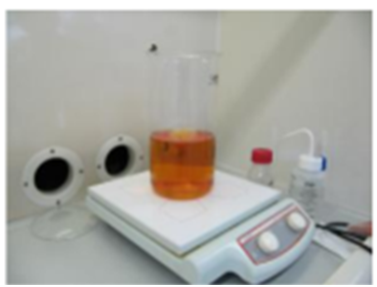 Determination of Pb-210 from water sample using Trischem Sr-resin from STUK, Finland. Samples are first stabilised using Pb and Fe carrier, pH altered if required and sample heated until a yellow precipitate forms, allowed to cool and centrifuged to collect precipitate. Residue dissolved in HNO3, Separating 210Pb uses Trischem Sr columns, eluted using 8M HCl. 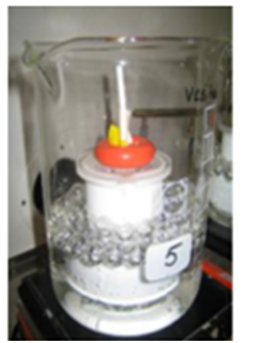 Sample is then evaporated to dryness, dissolved using HNO3, then transferred to a weighed scintillation vial. Re-weighing the vial and take 0.15 ml aliquot transferring to a weighed scintillation vial for AAS determination of Stable Pb. 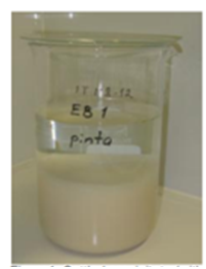 Stable Pb measured using AAS and 210Pb using liquid scintillation spectrometry after storing for 18 days. Determination of plutonium and americium analysis from soil, vegetation and sediment from STUK, Finland. Determination of polonium and lead from water samples from STUK, Finland. 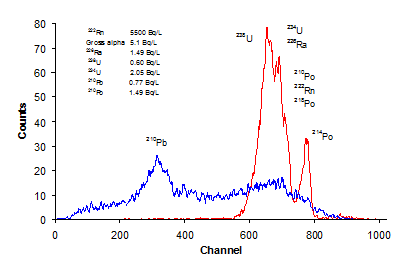 Determination of polonium is based on radiochemical separation and alpha spectrometric measurements. Water samples is spiked and evaporated, to a fixed volume. Transferred to a Teflon decanter, adding HCl, reduce and deposit Po on silver disk, count activity using AlphaAnalyst spectrometer. 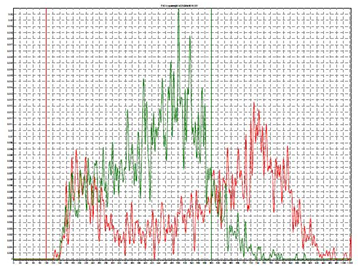 Store remaining solution for 6 months, spike mix and deposit Po on silver disk, counting using AlphaAnalyst spectrometer. Polonium and lead activities are then calculated. Pretreatment of seawater for transuranic analysis from STUK, Finland. Large volumes of seawater (litres), are acidified, precipitate formed and allowed to settle overnight. The precipitate transferred to the bottom of a precipitation vessel, the aqueous fraction removed by suction, precipitate washed with ammonia, allowed to settle, remove any remaining aqueous fraction. Dissolved in minimum volume of HCl and diluted with deionised water. Heat remaining sample and precipitate using Fe(OH)3, allow to cool and allowed to settle. Precipitate transferred and centrifuged, discarding solution. Dry precipitate and re-dissolve using acid and continue to purify sample for use in plutonium analysis. Pretreatment - STUK from STUK, Finland. Due to low level activity levels, the collected samples will be large volumes which require pre-treatment before analysis. Air filters are measured after pressing them into the correct geometry. Sea water are evaporated to smaller volumes, measured by gamma spectroscopy and if required further radiochemical analysis. Deposition, milk and drinking water are evaporated to dryness, residue ashed, measured by gamma spectroscopy and if required further radiochemical analysis. Soil samples are oven dried and sieved with and homogenised. Samples are freeze-dried and then homogenised measured by gamma spectroscopy. Terrestrial materials are oven dried and homogenised using a blender and measured by gamma spectroscopy. Fish samples are oven dried and ashed before gamma spectroscopy. Determination of radium analysis Ra-226, Ra-228 from STUK, Finland. 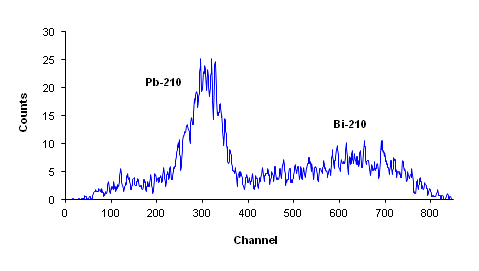 226Ra activity is calculated from the gross alpha spectrum of the basis of the counts measured in window set on the area of 214Po peak. This will give quite accurate results to 226Ra because no other natural or artificial radionuclides have alpha emissions on the same energy range. The counting efficiency of 214Po (and thus of 226Ra) in the selected window is between 80 - 86%. The lower limit of detection for 226Ra is 0.01 Bq/l at 95% confidence level for 0.038 litre water and 180 minute counting. Determination of radon analysis Rn-222 from STUK, Finland. 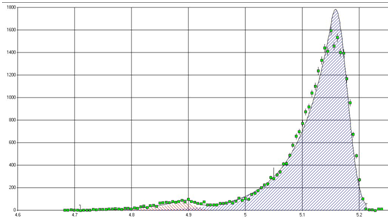 Radon is measured in a homogeneous solution with a liquid scintillation spectrometer 1414 Guardian-TM (PerkinElmer). The sample is prepared by adding water to a glass vial (equipped with a cap containing an aluminium foil) pre-filled with liquid scintillation cocktail Ultima GoldTM XR (Packard). The concentration of 222Rn calculated from the alpha spectrum in the window, which covers the most part of the alpha peaks. 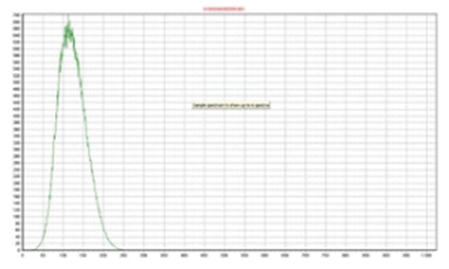 The alpha counting efficiency of radon in the selected alpha window is between 260 - 290%. Repeatability of the method is 4%. 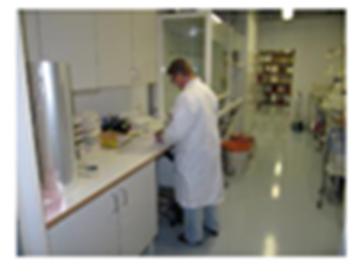 Determination of strontium analysis of plant samples from STUK, Finland. Determination of strontium is based on radiochemical separation and liquid scintillation or proportional counting. Weighed sample is prepared by ashing or microwave digestion. An oxalate precipitate formed and ammonia added and after dilution, precipitate allowed to settle, aqueous fraction discarded, centrifuged, dried and then ashed. 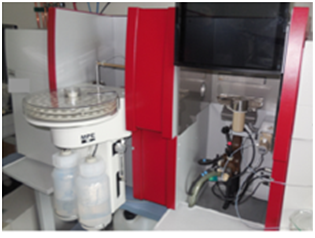 The Sr fraction was separated using Eichrom Sr resin columns, further purification stages required before counting by liquid scintillation counter or proportional counting. 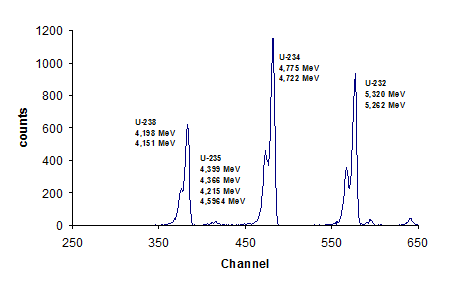 Determination of technetium analysis Tc-99 from STUK, Finland. The Tc separation method used is based on the Eichrom TEVA resin. Samples are prepared and spiked with 99mTc and the Tc fraction separated using TEVA resin. Chemical yield measured with gamma spectrometer for 99mTc. The Tc fraction prepared for counting using Ultima Gold AB liquid scintillation cocktail, after storing for a week, counting on a liquid scintillation counter. Determination of uranium from water samples from STUK, Finland. Uranium samples are first acidified and co-precipitated with iron hydroxide, heated and precipitate allowed to settle and centrifuged. The sample is washed with acid, evaporated; Uranium is separated with anion exchange resin (Dowex) and TiCl3 and HF are used afterwards to precipitate uranium; filtering uranium onto a membrane which is glued to a steel planchette. Samples are then counted using alpha spectroscopy. Ion chromatography from BfS, Germany. A physical-chemical procedure for material separation used for analysing purposes and for processing. 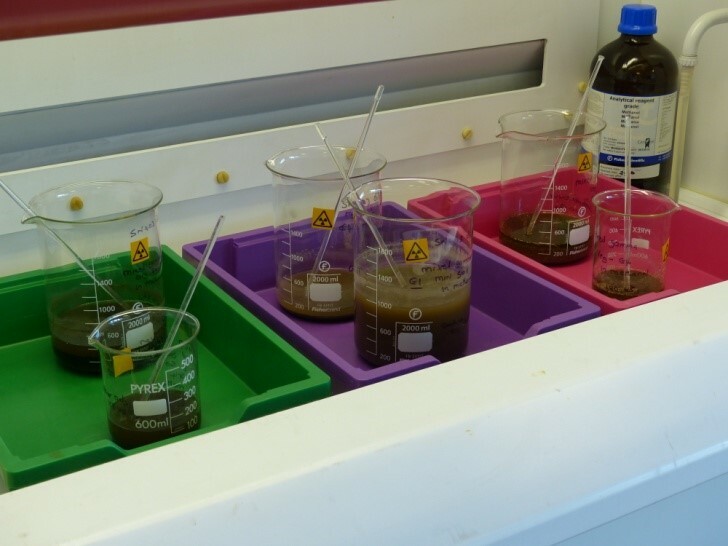 In practice, it is often used for analysing water and waste-water samples. There are anionic and cationic chromatographs. 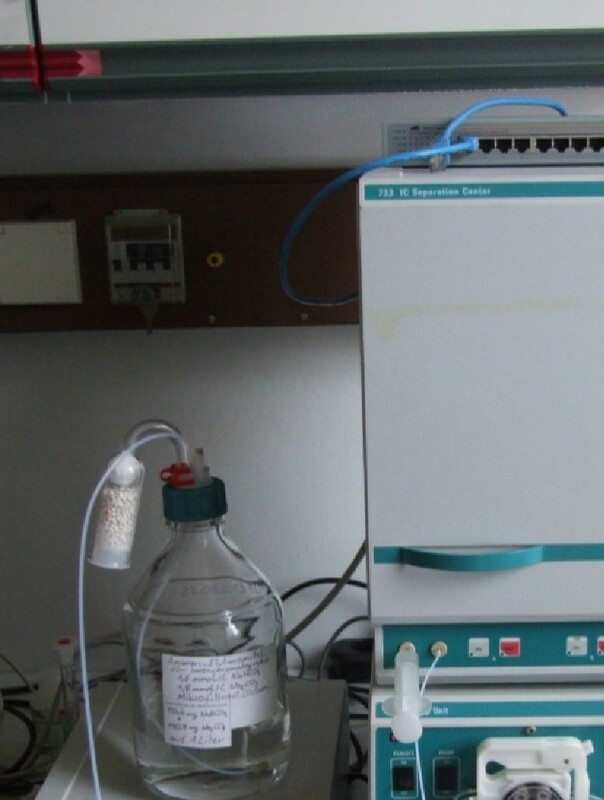 In the BfS laboratory an ion chromatograph with an anion column is exclusively used for analysis. The main problem encountered when analyzing highly saline solutions is the overloading of the analytical column with chloride. Information is provided on the preparation of soil, vegetation and aqueous gamma calibration materials. 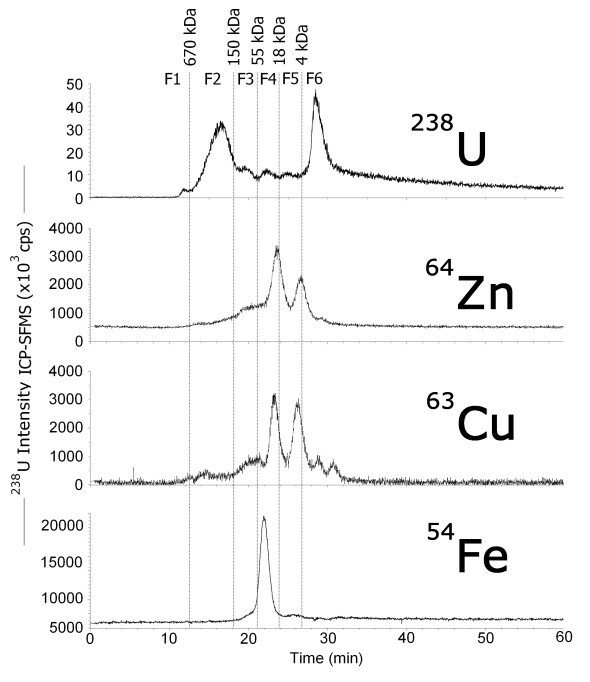 In the field of radioecology, ICPMS can be used i) to analyze trace metals, analogous to radionuclides or radioisotopes, but also essential metals of which homeostasis can be modified by the presence of radionuclides/radioisotopes, ii) to analyze long life radionuclides (such as uranium, thorium, etc) with a high sensitivity, to determine their isotopic composition or even to speciate them in different media.